Background and aims: Progression of chronic cholestatic disorders towards ductopenia results from the dysregulation of cholangiocyte survival, with cell death by apoptosis prevailing over compensatory proliferation. Currently, no therapy is available to sustain cholangiocyte survival in the course of those disorders. It was recently shown that cholangiocytes express the glucagon-like peptide-1 receptor (GLP-1R); its activation results in enhanced proliferative reaction to cholestasis. The GLP-1R selective agonist exendin-4 sustains pancreatic β cell proliferation and prevents cell death by apoptosis. Exendin-4 is now employed in humans as a novel therapy for diabetes. The aim of the present study was to verify whether exendin-4 is effective in preventing cholangiocyte apoptosis. Methods: In vitro, tests were carried out to determine if exendin-4 is able to prevent apoptosis of cholangiocytes isolated from normal rats induced by glycochenodeoxycholic acid (GCDCA); in vivo, animals subjected to 1 week of bile duct ligation and to a single intraperitoneal injection of CCl4 were treated with exendin-4 for 3 days. Results: Exendin-4 prevented GCDCA-induced Bax mitochondrial translocation, cytochrome c release and an increase in caspase 3 activity. Phosphatidylinositol 3-kinase, but not cAMP/protein kinase A or Ca2+/calmodulin-dependent protein kinase inhibitors, neutralised the effects of exendin-4. In vivo, exendin-4 administration prevented the increase in TUNEL (terminal deoxynucleotidyl transferase-mediated triphosphate end-labelling)-positive cholangiocytes and the loss of bile ducts observed in bile duct-ligated rats treated with CCl4. Conclusion: Exendin-4 prevents cholangiocyte apoptosis both in vitro and in vivo; such an effect is due to the ability of exendin-4 to counteract the activation of the mitochondrial pathway of apoptosis. These findings support the hypothesis that exendin-4 may be effective in slowing down the progression of cholangiopathies to ductopenia. Cholangiopathies are a challenge for clinicians: 20% of liver transplants among adults and 50% of those among paediatric patients are due to these disorders.3 This is associated, at least in part, with the fact that there is no therapy effective in maintaining an adequate cholangiocyte survival.1 The factors that regulate the balance between proliferation and death of cholangiocytes are undefined; such a lack of pathophysiological knowledge may contribute to slowing down the development of effective therapies for cholangiopathies. Therefore, the aim of this study was to verify if the GLP-1 analogue exendin-4 is also able to prevent cholangiocyte cell death by apoptosis. Thus, we asked the following questions. (1) Does exendin-4 prevent cholangiocyte apoptosis in vitro? (2) Which are the intracellular pathways that mediate the antiapoptotic effects of exendin-4 in cholangiocytes? (3) Is exendin-4 effective in sustaining cholangiocyte survival in vivo? Reagents were purchased from Sigma-Aldrich (Milan, Italy) unless otherwise indicated. Antibodies for immunoblotting were purchased from Santa Cruz Biotechnologies (Santa Cruz, California, USA), unless otherwise indicated. The antibody anti-cytokeratin (CK)-19 was purchased from Novocastra (Milan, Italy); the antibody anti-Bax was purchased from Cell-Signalling (Milan, Italy); Exendin-4 was purchased from American Peptide (Sunnyvale, California, USA). PD98059, Rp-cAMPS, KN62 and BAPTA/AM were purchased from Calbiochem (Milan, Italy). APO-ONE Homogeneous Caspase-3/7 Assay was purchased from Promega (Milan, Italy). Experiments were performed in cholangiocytes purified from normal rats, after a 1 h incubation at 37°C to regenerate membrane proteins damaged by proteolytic enzymes during the purification.10–12 During incubation, cells were kept in suspension in an RPMI medium,9 13 14 to which 5% fetal bovine serum (FBS) was added to limit the constitutive apoptosis. To verify whether exendin-4 protects cholangiocytes from cell death by apoptosis, cholangiocytes were incubated for 4 h at 37°C13 with: (1) 0.2% bovine serum albumin (BSA; control); (2) glycochenodeoxycholic acid (GCDCA, 400 μmol/l),15 16 in the absence or presence of a 30 min preincubation with exendin-4 (100 nmol/l).9 To verify the eventual cytoprotective effects of exendin-4 against bile acids with different cytotoxicity, cells were incubated with taurochenodeoxycholic acid (TCDCA, 50 μmol/l),17–19 in the absence or presence of a preincubation with exendin-4, as above described. Male Fischer rats (150–175 g), purchased from Charles River (Milan, Italy), were maintained in a temperature-controlled environment (20–22°C) with a 12 h light–dark cycle and with free access to drinking water and to standard rat chow. To study the effects of exendin-4 activation on cholangiocyte survival, our studies were performed in rats subjected to bile duct ligation (BDL). After 7 days, animals received vehicle or a single intraperitoneal injection of CCl4, 0.4 ml per 100 g body weight (50% mineral oil:CCl4), which triggers cholangiocyte cell death by apoptosis.20 Subsequently, animals were treated with either (1) exendin-4 (0.1 μg/kg body weight twice a day, intraperitoneally, n = 8) or (2) control injections (n = 8).9 21 Rats subjected to BDL, injected with vehicle and treated with control solution were used as internal controls (n = 4). No death in each experimental group was counted; at the end of the treatment, animals were sacrificed for liver sections. The treatment options and schedule are depicted in fig 1. Outline of the treatment protocol of our in vivo model. All the animals were subjected to bild duct ligation (BDL) at day 0. 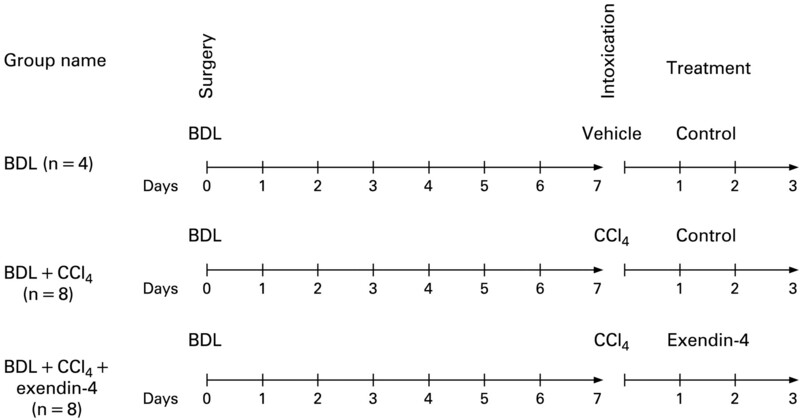 After 7 days, the group named BDL + CCl4 received a single intraperitoneal injection of CCl4 and then received control injection treatment for 3 days, as in previous studies (n = 8).20 The group named BDL + CCl4 + exendin-4 were subjected to the same surgery and CCl4 intoxication, but were treated for 3 days with exendin-4 (0.1 μg/kg body weight twice a day, intraperitoneally, n = 8).9 The group named BDL employed, as in previous studies,20 as a control for CCl4 intoxication, received a single intraperitoneal injection of a control vehicle and, afterwards control injections for 3 days (n = 4). The animals were fasted overnight before each experiment.9 13 Before each procedure, animals were anaesthetised with sodium pentobarbital (50 mg/kg intraperitoneally). Study protocols were performed in compliance with the institution guidelines. Purification of cholangiocytes from rat liver was performed using a monoclonal antibody (immunoglobulin M (IgM), kindly provided by Dr R Faris, Brown University, Providence, Rhode Island, USA) against an unidentified membrane antigen expressed by all rat intrahepatic cholangiocytes.22 At the end of each procedure, the purity of the cholangiocytes was assessed by cytochemistry for γ-glutamyltranspeptidase (γ-GT).9 13 23 Cell viability at the end of the purification procedure was determined by trypan blue exclusion and was found to be >96%. Changes in caspase 3 activation were measured by APO-ONE Homogeneous Caspase-3/7, according to the manufacturer’s instructions. Briefly, at the end of each experiment, 10 000 cells were resuspended with and incubated in a 1/100 dilution of the substrate Z-DEVD for 1 h. Fluorescence was measured by a 96-multiwell plate reader. Proteins obtained from mitochondrial and cytosolic extracts (10 μg/lane) were resolved by sodium dodecylsulfate (SDS)–12% polyacrylamide gel electrophoresis (PAGE) and then transferred onto a nitrocellulose membrane. After blocking, membranes were incubated overnight at 4°C with either anti-Bax or anticytochrome c antibodies, followed by incubation with the corresponding secondary antibody. Similarly, proteins obtained from whole-cell lysates (10 μg/lane) were resolved by SDS–12% PAGE and then transferred onto a nitrocellulose membrane. Membranes were then incubated with antiphospho-Akt and anti-Akt, followed by incubation with the corresponding secondary antibody. Equal loading was evaluated by incubating membranes with the anti-β-actin antibody.25 26 Proteins were visualised using chemiluminescence (ECL Plus kit; Amersham, Milan, Italy). The intensity of the bands was determined by scanning video densitometry using the Chemi Doc imaging system (Bio Rad, Milan, Italy). In vivo changes in cell death by apoptosis were assessed by terminal deoxynucleotidyl transferase-mediated triphosphate end-labelling (TUNEL) analysis, as previously described (ApopTag Kit, Oncor, Gaithersburg, Maryland, USA).10 After counterstaining with haematoxylin solution, liver sections (four for each treatment group) were examined by light microscopy. Approximately 100 cells per slide were counted in a coded manner in seven non-overlapping fields. Incubation with GCDCA induced apoptosis in cholangiocytes isolated from normal rats. GCDCA markedly increased the activity of caspase 3 compared with control (fig 2A; mean 16 672 (407), 95% CI 15 873 to 17 470). In comparison with untreated cells, GCDCA also enhanced Bax mitochondrial translocation and cytochrome c release, as suggested by increased expression of Bax in mitochondria (fig 2B; mean 257.06% (8.16%), 95% CI 241.04% to 273.07% of basal value) and cytochrome c in cytosol (fig 2C; mean 454.88% (45.87%), 95% CI 364.98% to 544.79% of basal value) fractions, respectively. Preincubation with exendin-4 limited the GCDCA-induced increases in caspase 3 activity (fig 2A; mean 3793 (800), 95% CI 2224 to 5361), Bax mitochondrial expression (fig 2B; mean 112.27% (11.84%), 95% CI 89.05% to 135.49% of basal value) and cytochrome c in cytosol (fig 2C; mean 227.76% (38.83%), 95% CI 151.65% to 303.86% of basal value). In vitro effects of exendin-4 on cholangiocyte apoptosis. (A) Glycochenodeoxycholic acid (GCDCA; 400 μmol/l) induced a significant increase in caspase 3 activity that was prevented by preincubation with exendin-4 (100 nmol/l). Similarly, expression of Bax in mitochondria (B) and of cytochrome c (Cyt c) in cytosol (C) was markedly enhanced by GCDCA. Both those changes were prevented by preincubation with exendin-4. (D) Taurochenodeoxycholic acid (TCDCA; 50 μmol/l) slightly but not significantly increased caspase 3 activity compared with untreated cells. Data are the mean (SE) of at least three experiments. *p<0.05 vs basal; #p<0.05 vs GCDCA. In contrast to GCDCA, TCDCA did not induce apoptosis in cholangiocytes, since it did not elicit any significant increase in caspase 3 activity (fig 2D; mean 5590 (1353), 95% CI 2937 to 8243). As shown in fig 3A, only preincubation with wortmannin (a PI3K inhibitor) neutralised the ability of exendin-4 to inhibit the activation of caspase 3 by GCDCA (GCDCA, mean 7047 (389), 95% CI 6285 to 7810; exendin-4+GCDCA, mean 3826 (834), 95% CI 2191 to 5461; wortmannin+exendin-4+GCDCA, mean 6406 (985), 95% CI 4475 to 8337). In contrast, no effects were observed when cells were pre-incubated with a cAMP-dependent PKA inhibitor (Rp-cAMPs), a CamKII inhibitor (KN62) or an intracellular Ca2+ chelator (BAPTA/AM). 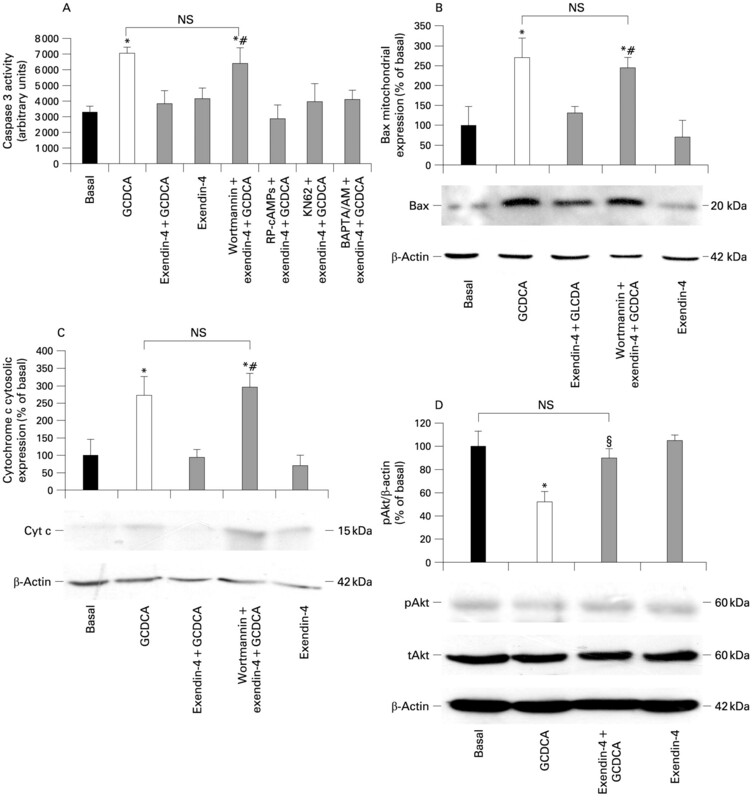 Intracellular signals mediating exendin-4 antiapoptotic effects on cholangiocytes. (A) Only the phosphatidylinositol 3-kinase (PI3K) inhibitor wortmannin (100 nmol/l) was able to neutralise the effect of exendin-4 (100 nmol/l) on the glycochenodeoxycholic acid- (GCDCA; 400 μmol/l) induced increase in caspase 3 activity. In contrast, no effects were observed when cells were preincubated with Rp-cAMPS (a cAMP-dependent protein kinase A inhibitor, 100 μmol/l), KN62 (a calmodulin-dependent protein kinase II inhibitor, 10 μmol/l) or BAPTA/AM (an intracellular Ca2+ chelator, 5 μmol/l). Similarly, wortmannin neutralised the effects of exendin-4 on the GCDCA-induced increase in Bax mitochondrial expression (B) and cytochrome c cytosolic expression (C). 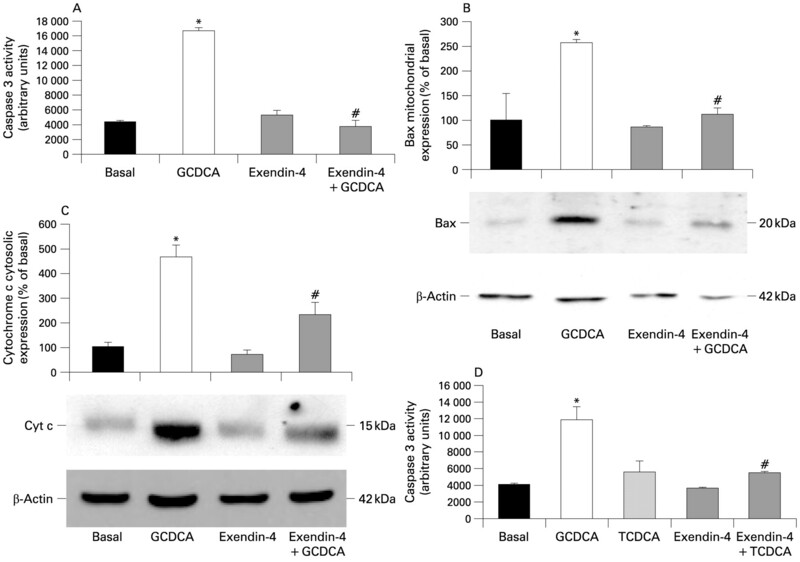 (D) Exendin-4 limited Akt dephosphorylation induced by GCDCA. Data are the mean (SE) of at least three experiments. *p<0.05 vs basal; #p<0.05 vs exendin-4 + GCDCA; §p<0.05 vs GCDCA; NS, not significant; pAKt, phosphorylated AKt; tAKt, total AKt. The blockage of PI3K signalling by wortmannin also abolished the ability of exendin-4 to prevent the GCDCA-induced increase in Bax mitochondrial expression (fig 3B; GCDCA, mean 270.34% (49.84%), 95% CI 172.63% to 368.04%; exendin-4+GCDCA, mean 131.01% (17.45%), 95% CI 96.79% to 165.22%; wortmannin+exendin-4+GCDCA, mean 245.74% (24.87%), 95% CI 196.99% to 294.48% of basal). Similarly, wortmannin neutralised the effects of exendin-4 on the GCDCA-induced increase in cytochrome c expression in the cytosol (fig 3C; GCDCA, mean 272.84% (53.99%), 95% CI 167.00% to 378.67%; exendin-4+GCDCA, mean 94.51% (23.25%), 95% CI 47.92% to 139.09%; wortmannin+exendin-4+GCDCA, mean 296.13% (39.32%), 95% CI 219.04% to 373.21% of basal). As a confirmation, cell preincubation with wortmannin prevented the reduction in Akt phosphorylation observed in cells exposed to GCDCA when compared with untreated cells (fig 3D: GCDCA, mean 51.97% (8.96%), 95% CI 34.40% to 69.55%; exendin-4+GCDCA: mean 89.87% (8.01%), 95% CI 95.86% to 114.14% of basal). As previously shown,20 in vivo, a single CCl4 injection to rats whose had undergone BDL for 1 week produced a significant increase in serum levels of ALT, ALP and bilirubin, and in liver inflammatory infiltrate20 (table 1). In contrast, administration of exendin-4 to rats produced a significant reduction of levels of hepatocellular injury and cholestasis and of the degree of liver inflammation (table 1). 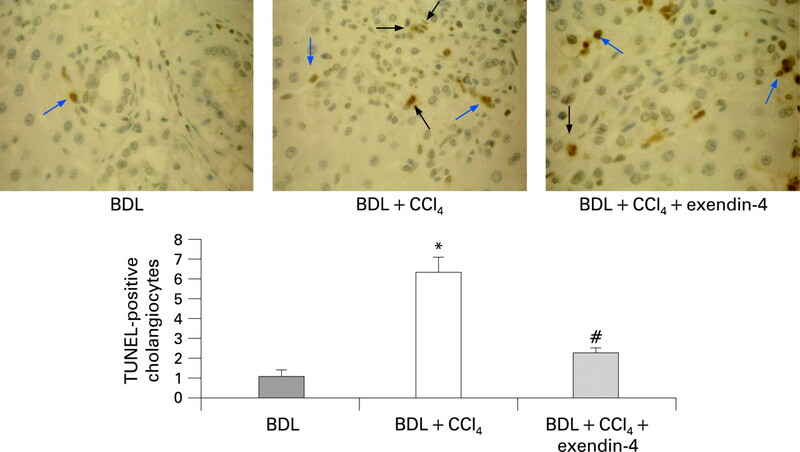 In vivo, a single CCl4 injection to rats subjected to BDL for 1 week induced cell death by apoptosis, as suggested by the relevant increase in the number of TUNEL-positive cells20 (BDL, mean 1.15 (0.29), 95% CI 0.58 to 1.71; BDL+CCl4, mean 6.51 (0.94), 95% CI 4.66 to 8.35). In contrast, administration of exendin-4 to rats produced a significant reduction of the apoptotic cholangiocytes (mean 2.31 (0.25), 95% CI 1.81 to 2.80; fig 4). Effect of in vivo exendin-4 administration on cholangiocyte apoptosis. CCl4 intoxication induced cholangiocyte death in rats subjected to bile duct ligation (BDL); treatment with exendin-4 markedly reduced the number of terminal deoxynucleotidyl transferase-mediated triphosphate end-labelling (TUNEL)-positive cholangiocytes. Black arrows indicate cholangiocytes positive by TUNEL staining. Blue arrows indicate other cells positive by TUNEL staining (internal control). Four slices for each rat were considered; seven fields per slice were considered. *p<0.05 vs BDL; #p<0.05 vs BDL + CCl4. Loss of bile ducts was induced in vivo by a single CCl4 injection to rats subjected to BDL for 1 week, as witnessed by the strong reduction of the bile duct mass (BDL, mean 8.01 (1.12), 95% CI 5.81 to 10.22; BDL+CCl4: mean 3.36 (0.50), 95% CI 2.38 to 4.34). In contrast, administration of exendin-4 to rats prevented the CCL4-induced reduction of bile duct mass (mean 6.33 (0.78), 95% CI 4.79 to 7.87; fig 5). Effect of in vivo exendin-4 administration on bile duct mass. 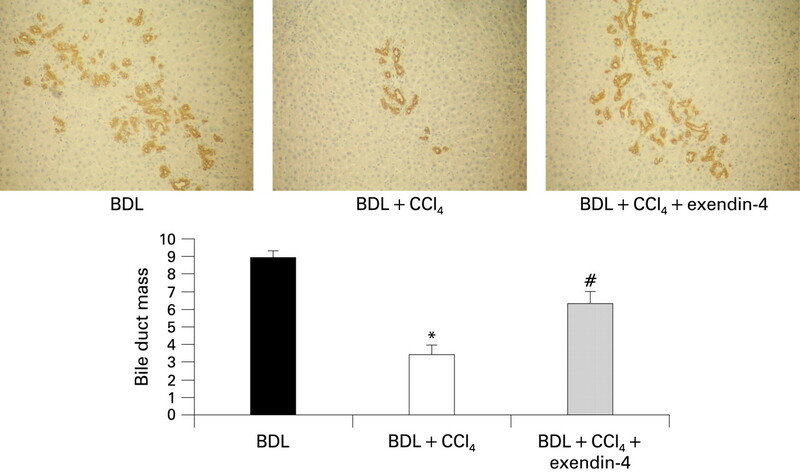 CCl4 intoxication markedly diminished, in rats subjected to bild duct ligation (BDL), the bile duct mass, estimated by the computerised analysis of cytokeratin-19 staining. Exendin-4 treatment prevented the CCl4-induced loss of bile ducts. Four slices for each rat were considered; seven fields per slice were considered. *p<0.05 vs BDL; #p<0.05 vs BDL+CCl4. The current study shows that exendin-4 protects the biliary epithelium from cell death by apoptosis, both in vivo and in vitro. Specifically, our study demonstrates that: (1) exendin-4 prevents cholangiocyte apoptosis induced, in vitro, by GCDCA; (2) the antiapoptotic effect of exendin-4 depends on PI3K inhibition of Bax mitochondrial translocation, cytochrome c release and caspase 3 activation; and (3) exendin-4 prevents cholangiocyte apoptosis and loss of bile ducts in an in vivo model of cholestasis and ductopenia. Apoptosis can occur substantially because of the activation of two defined molecular pathways, the extrinsic or intrinsic pathway.32 The extrinsic pathway is triggered at the plasma membrane following the activation of specific death receptors; the intrinsic pathway is triggered by different extracellular or intracellular stimuli that cause mitochondrial dysfunction.32 The activation of either one or the other pathway may depend on the kind of cell injury or on the cell type.32 However, the extrinsic and intrinsic pathways are not mutually exclusive32; in some cells, including hepatocytes and cholangiocytes, the death receptor pathway requires the mitochondrial signals to be amplified enough to deliver the proapoptotic message effectively.32 Thus, we wanted to investigate how exendin-4 affects the last steps of the apoptotic cascade in cholangiocytes. The in vitro incubation of cholangiocytes with GCDCA was associated with increased Bax expression in mitochondria and increased cytochrome c expression in cytosol (fig 2). Bax is a member of the family of Bcl-2 proteins, involved in the regulation of cell death.32 Upon the activation of the apoptotic machinery (either extrinsic or intrinsic), Bax migrates from the cytosol to mitochondria, where it causes membrane permeabilisation; as a consequence, cytochrome c is released from mitochondria into the cytosol, where it activates proteases mediators and effectors of programmed cell death, for example caspases.32 One of the main executor caspases is caspase 3. A similar sequence of events has also been shown to occur in hepatocytes upon incubation with GCDCA or other cytotoxic bile acids.25 40 41 Our in vitro system, therefore, reproduced the same cascade of events. Interestingly, when cells were preincubated with exendin-4 such a sequence of events was abolished (fig 2). These data suggest that exendin-4 is able to counteract the apoptotic machinery in cholangiocytes. In addition to that, we also showed that the antiapoptotic effects of GLP-1R activation are mediated by the activation of PI3K (fig 3). Indeed, blocking the PI3K pathway neutralised the effect of exendin-4 on Bax mitochondrial translocation and, as a consequence, cytochrome c release and caspase 3 activation. In several cell types, translocation of Bax can be modulated by PI3K signalling.42–44 As a confirmation, exendin-4 limited the dephosphorylation of Akt, which is immediately downstream of PI3K,45 induced by GCDCA. PI3K is a major determinant of cholangiocyte survival2 29 30 31 46 47; the current study strengthens such a concept, since amongst the different intracellular pathways that allow GLP-1R to enhance cholangiocyte proliferation (fig 6), PI3K is the only one to be involved in its antiapoptotic effects. Proposed sequence of events that mediate the antiapoptotic effects of glucagon-like peptide-1 receptor (GLP-1R) activation by exendin-4 in cholangiocytes. 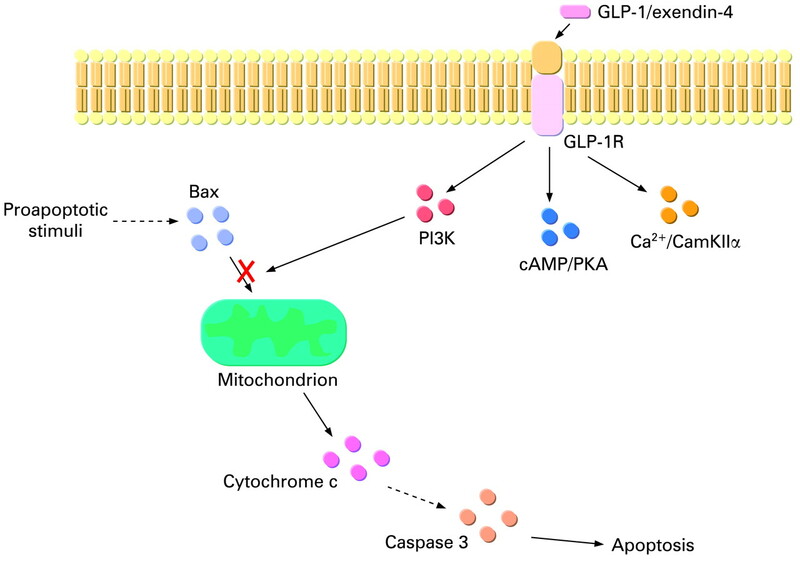 GLP-1R enhances the activation state of phosphatidylinositol 3-kinase (PI3K), which reduces Bax translocation to mitochondria. As consequence, cytochrome c release from mitochondria to the cytosol and the consequent activation of the caspase cascade is reduced. The cAMP/protein kinase A (PKA) and Ca2+/calmodulin-dependent protein kinase II (CamKII) pathways, which mediate the proproliferative effects, do not participate in the antiapoptotic actions of GLP-1R activation.
. The cholangiopathies: disorders of biliary epithelia. Gastroenterology 2004;127:1565–77.
. Proliferating cholangiocytes: a neuroendocrine compartment in the diseased liver. Gastroenterology 2007;132:415–31. Department of Health and Human Services, Health Resources and Services Administration. Annual Report of the US Organ Procurement and Transplantation Network and the Scientific Registry for Transplant Recipients: Transplant Data 1991–2000. Rockville, MD: Department of Health and Human Services, Health Resources and Services Administration, Office of Special Programs, Division of Transplantation, 2001.
. Biological actions and therapeutic potential of the glucagon-like peptides. Gastroenterology 2002;122:531–44.
. Minireview: glucagon-like peptides regulate cell proliferation and apoptosis in the pancreas, gut, and central nervous system. Endocrinology 2004;145:2653–9.
. Glucagon-like peptides: regulators of cell proliferation, differentiation, and apoptosis. Mol Endocrinol 2003;17:161–71.
. Effect on glycemic control of exenatide (synthetic exendin-4) additive to existing metformin and/or sulfonylurea treatment in patients with type 2 diabetes. Diabetes Care 2003;26:2370–7.
. Lack of effect of incretin hormones on insulin release from pancreatic islets in the bile duct-ligated rats. Am J Physiol Endocrinol Metab 2001;280:E59–64.
. Glucagon-like peptide-1 and its receptor agonist exendin-4 modulate cholangiocyte adaptive response to cholestasis. Gastroenterology 2007;133:244–55.
. Ca2+-dependent cytoprotective effects of ursodeoxycholic and tauroursodeoxycholic acid on the biliary epithelium in a rat model of cholestasis and loss of bile ducts. Am J Pathol 2006;168:398–409.
. Regrowth of the rat biliary tree after 70% partial hepatectomy is coupled to increased secretin-induced ductal bile secretion. Gastroenterology 1996;111:1633–44.
. Secretin stimulates exocytosis in isolated bile duct epithelial cells by a cyclic AMP-mediated mechanism. J Biol Chem 1992;267:15523–9.
. Endogenous opioids modulate the growth of the biliary tree in the course of cholestasis. Gastroenterology 2006;130:1831–47.
. Autocrine/paracrine regulation of the growth of the biliary tree by the neuroendocrine hormone serotonin. Gastroenterology 2005;128:121–37.
. Glycochenodeoxycholate (GCDC) inhibits cytokine induced iNOS expression in rat hepatocytes. J Surg Res 2007;138:15–21.
. Bile acids stimulate cFLIP phosphorylation enhancing TRAIL-mediated apoptosis. J Biol Chem 2003;278:454–61.
. Phosphatidylinositol 3-kinase-dependent signaling modulates taurochenodeoxycholic acid-induced liver injury and cholestasis in perfused rat livers. Am J Physiol Gastrointest Liver Physiol 2005;289:G88–94.
. Resistance of rat hepatocytes against bile acid-induced apoptosis in cholestatic liver injury is due to nuclear factor-kappa B activation. J Hepatol 2003;39:153–61.
. Chenodeoxycholic acid and taurochenodexycholic acid induce anti-apoptotic cIAP-1 expression in human hepatocytes. J Gastroenterol Hepatol 2006;21:1807–13.
. Acute carbon tetrachloride feeding induces damage of large but not small cholangiocytes from bile duct ligated rat liver. Am J Physiol 1999;276:G1289–301.
. Effect of glucagon-like peptide-1(7-36) and exendin-4 on the vascular reactivity in streptozotocin/nicotinamide-induced diabetic rats. Pharmacology 2005;74:119–26.
. Isolation and morphological characterization of bile duct epithelial cells from normal rat liver. Gastroenterology 1989;97:1236–47.
. Biliary physiology in rats with bile ductular cell hyperplasia. Evidence for a secretory function of proliferated bile ductules. J Clin Invest 1988;81:569–78.
. Translocation of Bim to the endoplasmic reticulum (ER) mediates ER stress signaling for activation of caspase-12 during ER stress-induced apoptosis. J Biol Chem 2004;279:50375–81.
. cAMP inhibits bile acid-induced apoptosis by blocking caspase activation and cytochrome c release. Am J Physiol Gastrointest Liver Physiol 2002;283:G727–38.
. The increase in mitochondrial association with actin precedes Bax translocation in apoptosis. Biochem J 2006;396:1–5.
. Estrogens maintain bile duct mass and reduce apoptosis after biliodigestive anastomosis in bile duct ligated rats. J Hepatol 2006;44:1158–66.
. Thyroid hormone inhibits biliary growth in bile duct-ligated rats by PLC/IP(3)/Ca(2+)-dependent downregulation of SRC/ERK1/2. Am J Physiol Cell Physiol 2007;292:C1467–75.
. Taurocholate prevents the loss of intrahepatic bile ducts due to vagotomy in bile duct ligated rats. Am J Physiol 2003;284:G837–52.
. Taurocholate feeding prevents CCl4-induced damage of large cholangiocytes through PI3-kinase-dependent mechanism. Am J Physiol Gastrointest Liver Physiol 2003;284:G290–301.
. Cytoprotective effects of taurocholic acid feeding on the biliary tree after adrenergic denervation of the liver. Liver Int 2007;27:558–68.
. Apoptosis: a mechanism of acute and chronic liver injury. Gut 2005;54:1024–33.
. Apoptosis: the nexus of liver injury and fibrosis. Hepatology 2004;39:273–8.
. Primary biliary cirrhosis. N Engl J Med 2005;353:1261–73.
. Fas enhances fibrogenesis in the bile duct ligated mouse: a link between apoptosis and fibrosis. Gastroenterology 2002;123:1323–30.
. The pathobiology of biliary epithelia. In: Arias IM, Boyer JL, Chisari FV, et al.The liver; biology and pathobiology. Philadelphia, PA: Lippincott Williams & Wilkins, 2001:421–35.
. Ursodeoxycholate and tauroursodeoxycholate inhibit cholangiocyte growth and secretion of BDL rats through activation of PKC alpha. Hepatology 2002;35:1041–52.
. Ursodeoxycholic acid aggravates bile infarcts in bile duct-ligated and Mdr2 knockout mice via disruption of cholangioles. Gastroenterology 2002;123:1238–51.
. Exendin-4, a glucagon-like protein-1 (GLP-1) receptor agonist, reverses hepatic steatosis in ob/ob mice. Hepatology 2006;43:173–81.
. Ursodeoxycholic acid may inhibit deoxycholic acid-induced apoptosis by modulating mitochondrial transmembrane potential and reactive oxygen species production. Mol Med 1998;4:165–78.
. Ursodeoxycholic acid prevents cytochrome c release in apoptosis by inhibiting mitochondrial membrane depolarization and channel formation. Cell Death Differ 1999;6:842–54.
. Ceramide induces p38 MAPK-dependent apoptosis and Bax translocation via inhibition of Akt in HL-60 cells. Cancer Lett 2008;260:88–95.
. The phosphatidylinositol 3-kinase (PI3K)–Akt pathway suppresses Bax translocation to mitochondria. J Biol Chem 2002;277:14040–7.
. Akt/protein kinase B inhibits cell death by preventing the release of cytochrome c from mitochondria. Mol Cell Biol 1999;19:5800–10.
. The phosphoinositide 3-kinase pathway. Science 2002;296:1665–7.
. Glucagon-like peptide-1 inhibits apoptosis of insulin-secreting cells via a cyclic 5′-adenosine monophosphate-dependent protein kinase A- and a phosphatidylinositol 3-kinase-dependent pathway. Endocrinology 2003;144:1444–55.
. Adrenergic receptor agonists prevent bile duct injury induced by adrenergic denervation by increased cAMP levels and activation of Akt. Am J Physiol Gastrointest Liver Physiol 2006;290:G813–26.
. Secretin: a pleiotrophic hormone. Ann NY Acad Sci 2006;1070:27–50.
. Ductal cells of the pancreas. Int J Biochem Cell Biol 2005;37:504–10.
. Ductular cell proliferation in islet cell neogenesis induced by incomplete ligation of the pancreatic duct in dogs. Surg Today 2004;34:586–92.
. In vitro trans-differentiation of adult hepatic stem cells into pancreatic endocrine hormone-producing cells. Proc Natl Acad Sci USA 2002;99:8078–83.
. Protection and reversal of excitotoxic neuronal damage by glucagon-like peptide-1 and exendin-4. J Pharmacol Exp Ther 2002;302:881–8. Funding: This work was supported by MIUR grant 2005067975_004 to MM and by the Università Politecnica delle Marche intramural grants ATBEN00205 to AB and ATMAR01105 to MM; by a VA Merit Award, a VA Research Scholar Award, the Dr Nicholas C. Hightower Centennial Chair of Gastroenterology from Scott & White and NHS grants DK062975 and DK076898 to GA. The authors are grateful to Dr Paolo Onori, Department of Experimental Medicine, University of L’Aquila, L’Aquila, Italy, for his valued support in the histochemical studies.